I have finally caught up on all the India posts. Just in time too, I have so much to share from my Santa Barbera and Austin trips. To close off India I played a sort of “blank” meal game. The four stories below are the outcome of the questions I asked myself about eating in India. I think these questions cover the spiritual, fearful, gastronomical and monumental aspects of my journey. I asked myself these four questions. I hope you all enjoyed the India fun. Next time you take a trip perhaps you can ask yourself these four questions and let me know your answers. I’d love to hear from you. 1. What’s the memorable meal you had? 2. What’s the calmest meal you had? 3. What’s the riskiest meal you had? 4. What’s the best meal you had? Ohh…btw… The above pic is of my breakfast the morning I woke up in Munnar. 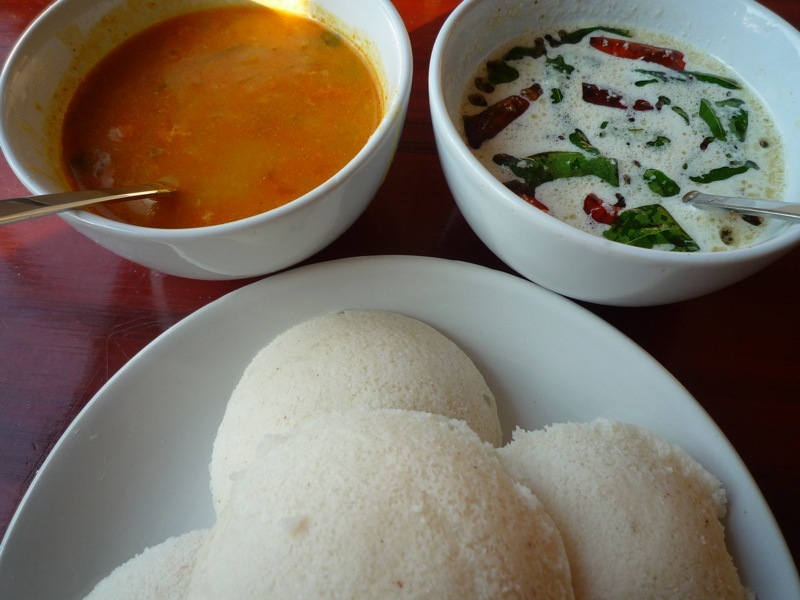 Fresh idlis with a curry sauce and a coconut chutney. Par for the course by day 12 in India.